Areas of Practice | Campbell, Yost, Clare & Norell, P.C. We have the expertise, knowledge, and know-how to research, write briefs, and successfully argue appeals, special action petitions, and petitions for review in Federal and State Courts. We also represent clients in administrative proceedings and appeals from those proceedings. We represent airlines, pilots, airframe and engine mechanics, fixed base operators, and aircraft and aircraft component manufacturers. We represent business and corporate clients in matters involving business formation, corporate compliance, mergers and acquisitions, changes in corporate form or structure, and general contract issues. We represent for-profit and non-profit corporations, partnerships, joint ventures and limited liability companies. We assist you to identify and reach your short and long-term goals. We represent business entities in litigation and business disputes, including breach of contract, collections, RICO claims, class actions, UCC, warranty and trade secret matters, fraud, and consumer fraud actions. We represent lenders and borrowers in commercial transactions, secured and unsecured lending, asset-based and real estate lending, project and acquisition financing, and letters of credit. We also assist lenders and borrowers with troubled loans, loan restructuring, and foreclosure. We offer legal services relating to the acquisition, development, financing and management of real estate. We represent large and small developers, financial institutions, investors, contractors, owners, landlords and tenants regarding office, retail, medical, restaurant, industrial, multi-family residential and resort properties. We defend claims and lawsuits alleging construction defect and work-site accidents. We have knowledge and experience representing subcontractors and know how to handle complex issues arising from contractual commitments, including indemnity and AI obligations. We advise and represent clients in a variety of employment matters, including those before hospital credentialing committees, the Civil Rights Division of the Arizona Attorney General's Office, the Equal Employment Opportunity Commission, and State and Federal Courts. We handle cases including sexual harassment, Title VII, § 1983, whistle-blower actions, retaliation charges, covenants not to compete, employment discrimination claims, and civil rights. 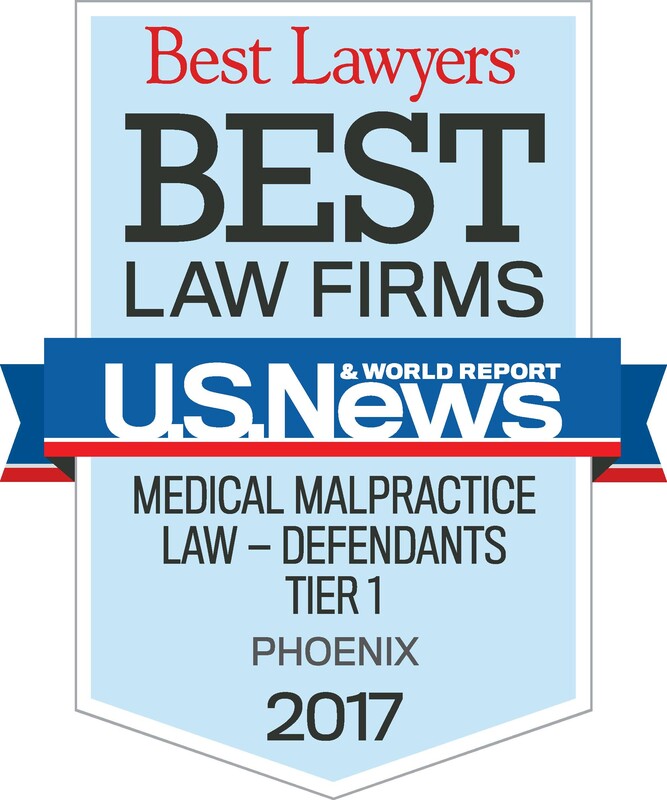 We defend healthcare providers in virtually every medical specialty in medical malpractice actions and before licensing boards. We also represent hospitals, nursing homes, specialty hospitals, surgery centers, clinics, long-term care facilities, behavioral health facilities, laboratories, physician groups, chiropractors, dentists, psychologists, psychiatrists, pharmacists, nurses, advanced practice nurses, therapists and other allied health professionals, social workers, emergency medical personnel, and first responders. Common claims include: birth injuries, assault and battery, informed consent, wrong-site surgery, failure to diagnose, delay in treatment, neglect, abuse, foreign body retention, misdiagnosis, delayed diagnosis, prescription errors and mis-fills, medication errors, overdoses, laboratory errors, diagnostic interpretation, chain of command, falls, pressure ulcers, inadequate assessment, suicide risk, and negligent credentialing and supervision. We represent hospitals, clinics, physicians, dentists, psychologists, physician's groups, and other health care entities and health care professionals on matters related to practice formation and organization, state and federal regulatory matters, antitrust concerns, employee benefits and contracts, medical staff and licensing issues, ethical principles, and general corporate matters. We represent physicians and institutions in legal issues related to medical research and biotechnologies. We represent Institutional Review Boards (IRBs), medical research programs, and investigators, and provide guidance to clients on state and federal laws regulating medical research and contracting issues. We represent clients in matters before the Food and Drug Administration, the Office of Human Resource Protections, and other regulatory authorities. We also handle litigated matters, including class actions related to medical products and devices. Litigation is the heart of our practice. Most of the attorneys at CYCN are trial lawyers. We represent clients in personal injury claims, commercial matters, insurance defense, insurance law, and coverage matters. We litigate matters from A to Z, including accidents, bad faith, car accidents, civil rights, construction, defamation, employment, fraud, insurance coverage, insurance defense, libel and slander, motor vehicle liability, personal injury, pharmacy negligence, premises liability, product liability, professional liability (accountants, architects, lawyers, etc. ), roadway design, transportation, trucking, and wrongful death. We try cases at every level of the Arizona court system, in federal courts, and before state and federal administrative agencies. We use dynamic trial presentation technology to present high impact presentations to juries and judges. We represent Native American Tribes in matters of tribal government, tribal finance, Native American gaming, health care, natural resources, banking, real estate, and low-income housing and economic development in Native American Country.